Since the refractive index of x-rays in matter is (slightly) smaller than one, focusing x-ray lenses have a biconcave form which, furthermore, must be parabolic in order to reduce aberrations (Figure 1). Due to the very weak refraction of x-rays in matter a focal length in the meter range is achieved by choosing a small radius of curvature R (= 0.05 mm up to a few mm) at the apex of the paraboloid and by stacking many individual lenses in a row. This arrangement is called a compound refractive lens (CRL, Figure 2). Our refractive x-ray lenses are available as paraboloids of revolution (2D lenses, Figure 1 left) and as parabolic cylinders (1D lenses, Figure 1 right), focusing in both directions or only in one direction. Figure 1 shows the typical relative dimensions of x-ray lenses with R = 0.5 mm. X-ray lenses from RXOPTICS can be used like glass lenses are used for visible light. The main difference is that the numerical aperture is small (of the order 10-3 to 10-4 as compared to a value of 10-1 to 1 for glass lenses). This makes the optical set-up very slender which, by the way, helps reducing aberrations. The geometric aperture 2R0 (see Figure 1) varies from several tenths of a mm to a few mm. This matches well the dimensions of the x-ray beams of most synchrotron radiation sources. The absorption of x-rays in matter being rather high (compared to the absorption of visible light in glass) the lens material must be a low Z material; we mainly employ beryllium, aluminium and nickel. Compared to plastics, metallic lens materials have the big advantage of avoiding radiation damage and of providing good heat conductivity. Indeed, experience has shown that beryllium lenses are able to withstand both the white beam of an undulator and the intense beam of an x-ray free-electron laser. 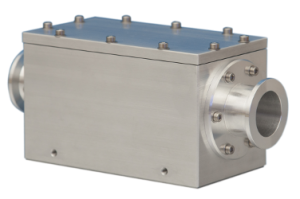 Our optical devices cover a very wide energy range, roughly from 2 keV to 150 keV. Note that this range is much larger than for any other optic. Moreover, refractive lenses are about a factor 1000 less sensitive to surface roughness and contamination than mirrors. Lenses are much more insensitive to misorientations and vibrations than mirrors. 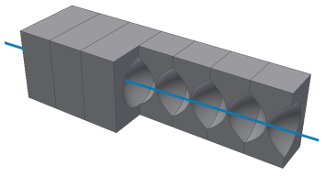 Nevertheless, it is necessary to align the optical axes of the individual lenses in a stack with micrometer precision. Furthermore, during operation the lens stack must be installed in high vacuum. 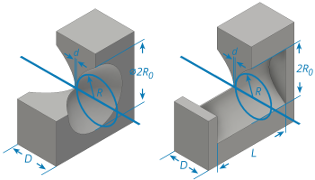 To this end, we provide high precision lens casings that can be integrated in the vacuum of a beam line (Figure 3). At both ends of the lens stack should be installed a pinhole or slit in order to reduce the scattered radiation. Compound refractive lenses from RXOPTICS are robust and compact, easily installed, aligned, and removed. There is no need for sophisticated benders or order sorting apertures. The focus stays on axis so that there is no need for rearranging the optical components downstream. Alignment of the CRL is done in a short time (typically well below half an hour). Refractive x-ray lenses show strong chromatic aberration. For a fixed focal length, the number of lenses in the stack must be varied when the energy is varied during an experiment. This disadvantage can be avoided by employing a device called transfocator which has been developed at ESRF in Grenoble.